Bhanumathi (Sai Pallavi) is a village belle who has some ideologies. She doesn’t want to go away from her village after the marriage. She says she will only marry a person who is okay with it. Her sister gets married to an NRI. 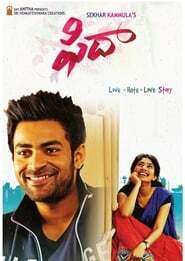 His brother is Varun (Varun Tej), a medico who doesn’t like to stay in India. The couple fall in love but they cannot be together for obvious reasons. Egos comes to the fore and the gap widens.